You can make the most of your boating experience by renting a slip with us. 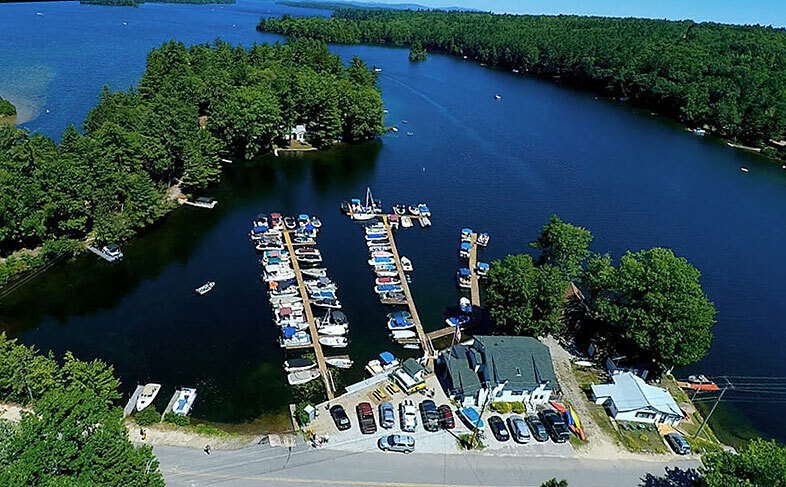 Enjoy the convenience of simply hopping on your boat and cruising beautiful Thompson Lake within minutes of your arrival. No more hassles with trailering and parking! A seasonal 2018 slip rental with us is only $900 for boats less than 20 feet in length or $1,100 for boats 20 feet and more – much less than all of the local marinas. And compare the advantages of costs and being on Thompson Lake – one of the best kept secrets in the Lakes Region. A seasonal slip allows you boat access as soon as the docks are in, all summer right through Columbus Day weekend. Just need a slip for a short stayover on the lake? We offer nightly, weekly, and monthly options based on availability. Check with us and we will try to meet your needs! You will also have comfort in knowing that your boat is in a sheltered cove. You will be protected from the waves and wind that can come up on the main part of Thompson. Our marina is regularly patrolled during the day and lit well at night. It is owner occupied during the season to ensure your boat is always monitored.